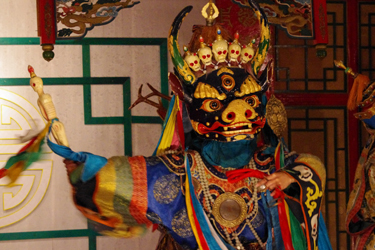 The main religion of Mongolia is the tantric Buddhism ( Vajrayana) of Tibetan lineage (Gelugpa). The links between the Mongolian Buddhism and the Tibetan Buddhism are very ancient, and very narrow. In 16th century, Helatan Khan, who tried to unify the various branches of the Mongol people, got closer to Tibetans and created Dalai Lama's title (Ocean of Wisdom), still used today. He awarded this title to Sonam Gyatso, leader of the Gelugpa, usually called "school of the yellow hats". Posthumously, this title is also attributed to both predecessors of Sonam Gyatso, thus he became the 3rd Dalai Lama. Helatan Khan invited twice the third Dalai Lama in Mongolia (on 1569, 1578) and converted to the Tibetan Buddhism during the second visit of the lama. 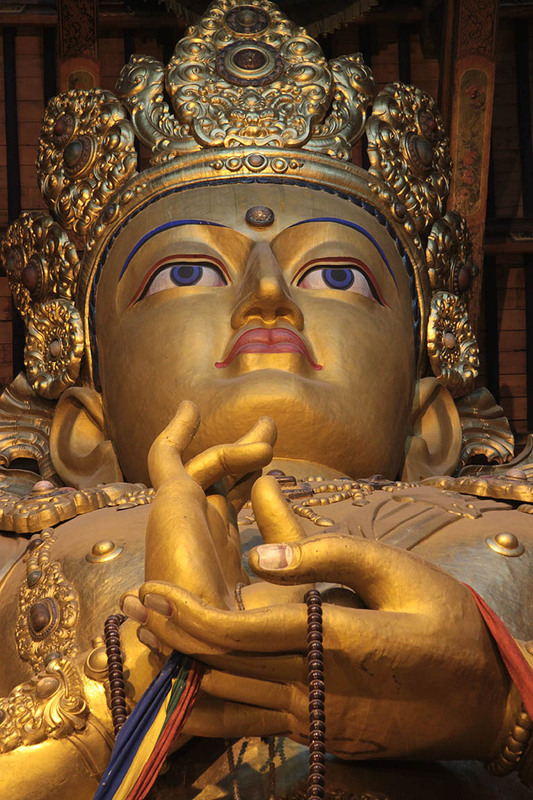 The Gelugpa school, established by Tsongkhapa in 13th century, is characterized by the importance of the tantric divinities, the most important of which are Chenrezig (Tchenrezi-Avalokisteshvara), and Tara under their various declensions, and sometimes under their "wrathful" said shape. These divinities are often used as yidam, support of meditation. It is Avalokisteshvara who is evoked in the famous mantra "Oma Mani Peme Ung". The arrival of the communists to the power marked the darkest hours of the Buddhism in Mongolia. In 1939, almost all the Buddhist monasteries were destroyed and the monks were killed, or obliged a return in the agricultural life in the most isolated regions of the country. 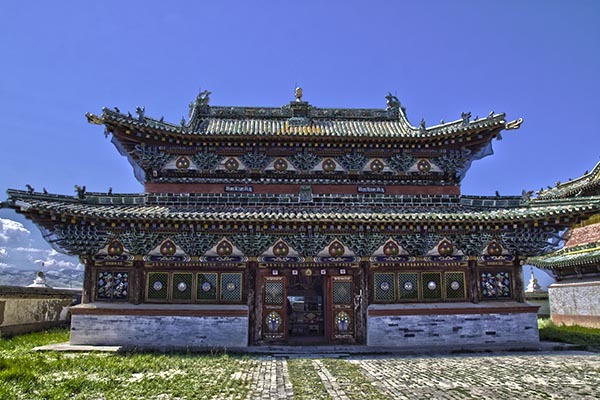 During the entry of Mongolia in the democracy, at the beginning of the 90s, only one monastery remained in service, with hardly more than a hundred monks (lamas). The freedom of worship having been restored, and the country retying with its cultural and religious roots, 200 temples and monasteries welcome approximately 5000 monks today. Even if it is not any more State religion, the Tibetan Buddhism remains the religion of more than 60 % of the Mongols today. Second religion of the country, the Islam is the cult of the kazakh minority and is concentrated in certain western provinces of Mongolia, in the Altai mountains. About 8 to 9 % of the population is Muslim, with 34 mosques and a madrassa. The democratization of Mongolia had for consequence the recent arrival of the Christianism and new religions. The growth of Christianism would be fast, the percentage of the Christians would be to become equivalent to that of the Muslims. Most of the Christian groups or of Christian origin (catholic, evangelic, Adventist, Mormons, Jehovah's Witnesses) would be active mainly in the capital, Oulan Bator. As often, the Buddhism was not expand in Mongolia at the cost of the ancient spiritual traditions, but it overlapped to them. The tengrism and the shamanism, in particular, are very alive even today. The tengrism, which calls "eternal Blue Sky", is a survival of roots common to the Mongol and Turkish peoples. The invocation of Tengri remains today omnipresent in the most daily acts. Also, the blue color is very often used in religious practice, even Buddhist. The shamanism is also still very practised, especially in the provinces of the North. It leans on a getting in touch of the shaman with the spirits of the nature and the ancestors. The shaman can be questioned to solve most of the daily problems, that it is about human health, or about proper functioning of the herds. Generally speaking, the Mongols evolve in a natural environment where the spirits reign. The man and the nature are connected, and trees, mountains, animals are considered as being sacred. The yurt - called Ger by the Mongols - resumes under a symbolic shape this narrow link between the Mongol people and the extreme nature in which they live. Its round shape evokes the night sky, its orientation answers precise instructions, and numerous rules must be respected when we enter the house of a traditional Mongolian family. Throughout your journey, you will cross ovoos, these stony hillocks, often surmounted by blue slings and by diverse offerings. The ovoo is strongly connected to the travel. During their travels, Mongolian never miss the opportunity to stop near one of the ovoos which mark out tracks. It is then advisable to walk three times clockwise around the ovoo. These places are sacred. They also offer there slings of color sky blue, called "khadags" as offerings. Mongolian also consider as bringing bad luck to begin a journey on Tuesdays.